A rural mission hospital in NW Zimbabwe. Sharing the gospel of Jesus Christ through hospital evangelism. My visitors were off to Victoria Falls this week. 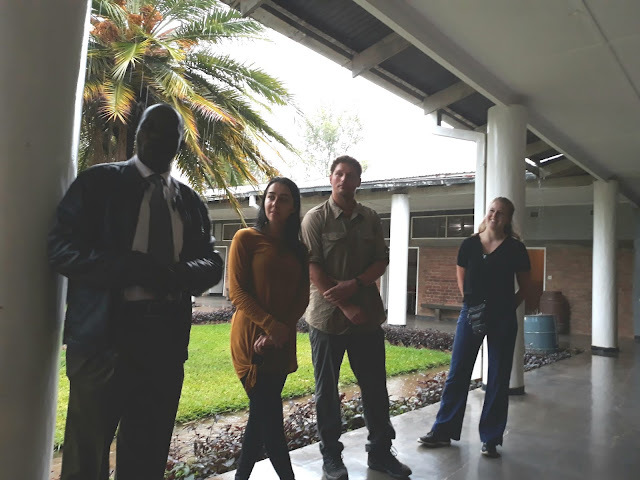 They went to Harare and picked up a new visitor, April Crothers from Kansas and off they went Sunday for 3 days in Victoria Falls. They get back to Harare Tuesday night and then pick up another visitor at the airport on Wednesday afternoon and then head home. Gives me a few days by myself to get ready for the 2 new visitors and cooking for 6 of us when they get home! Yesterday morning we took the LandRover and the tractor and trailer and headed off for a Big Sunday at Mukowe (3 hours from here). Big Sunday means several churches from 1 area meet together for service, usually the last Sunday of the month and they take turns to be the location where held. This Sunday we had Hambakwe, Batanai, Jinga, Chijkawi, and Marere churches meet at Mukowe church. We had 22 people in our LandRover going and 23 coming back! Yes we can fit that many people in (some were kids). Then Major drove the tractor and there were 48 in the tractor trailer and riding on the tractor mostly church members from Batanai! We finally arrived at 1 p.m. and they had been singing since 11 a.m. waiting for us. They had been meeting in a classroom, but by the time we arrived there were too many people and so we moved outside. By the time were outside there were well over 250 people there. After 3 more hours of singing, dancing and preaching, they fed us all sadza and chicken and we all headed for home at 5:15 p.m. We got home at 8:15 p.m. after a full day of church, but it was wonderful and our car was singing all the way there and back. We do it again in a month when we go to Chijawi. We were happy to be at Mukowe as this is where we have built the 2 school blocks and teachers houses through the generous financial help of ZRSD program from the UK. Major was able to meet with the headmaster and builder and talk about some things they need to work on in the buildings. Sadza and chicken for lunch at 4 p.m.
We started this week by welcoming many visitors to Chidamoyo Hospital.On Sunday evening, the 22nd of February Dr. Stephanie Huang from Santa Rosa, CAarrived with her 2 sons Julian and Lucas .Stephanie who is an ENT surgeon came last year in June and said she really wanted to come back with her sons and so we are happy to welcome them for 2 weeks. Every Monday morning we have Viral Load draw day for our 5,249 patients on ART. the viral load tells us if the medication is working to control their AIDS and if they are taking their medicine. We start drawing by 0645 and at 0800 Major comes to do devotions for us. This has been a special time of encouragement for our patients. Well things have quieted down a bit in the country.Still no buses moving in our area and a few Kombis.This has kept our patient load down a lot, bringing in only the most serious patients.Many are coming in Scotch Carts or paying someone with a private car to bring them. This last week we have had lots of rain in our area which has been great.Some of the maize might be saved in our area.We have enjoyed rain every day since last weekend and cloudy skies which helps keep the land wetter.Keep praying for rain!The southern part of the country will have drought this year.With the bad economic times in the country this means many will be without food. This week I had 3 young college graduates join me here.Claire, is from Illinois and has been accepted into a Physician’s Assistant program in Boston that starts this fall.She was here in Jan-Feb 2018 and decided to come and join us again before she starts school. She is here for 5 weeks. It has been a few weeks of very busy time for us at Chidamoyo.On August 20 we welcomed a team of Physical Therapy students from University of Washington.We welcomed Ben, Brian,Ellee, Nicole, Elisa, Sam and 3 teachers Sara, Kendra and Lisa.Kendra has been here 3 times and Sara twice, so it was great to have them back again. The students kept busy with our Rehab Tech, Brighton Kamhuka. 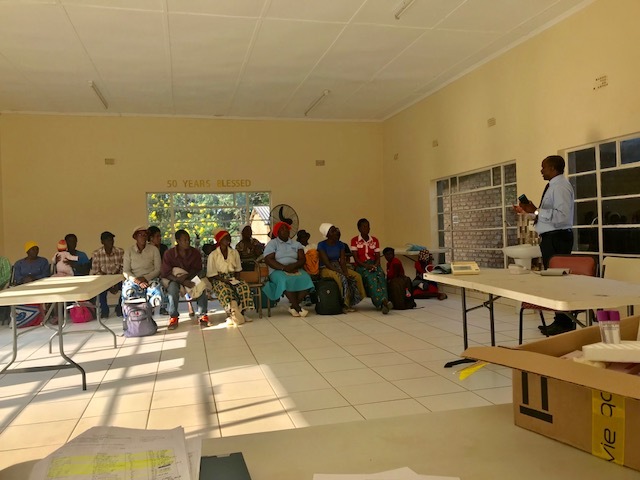 They did several teaching sessions with Village Health workers, a workshop for parents with kids who have Cerebral Palsy and went out to some outreach clinics in the area.They saw a lot of patients and helped our Village Health Care Workers to identify people with disabilities. They also helped with a couple of Well Baby Clinics and did some in-services for the nurses.They kept very busy and enjoyed their time here. They spent a weekend at Major’s village and ended their time here with a trip to Rhino Camp with Major and then they flew on to Victoria Falls for a few days before leaving. I am a Nurse Practioner who has been working at a rural mission hospital for 38 years. New church, Progress on Fire Re-build!